The great thing about this graph is that it shows not only working satellites–but also ones out of commission, as well as how much significant space junk each country has created. Looking at the data, you can kind of guess at which countries are the equivalent of a slob throwing burger wrappers out the car window. 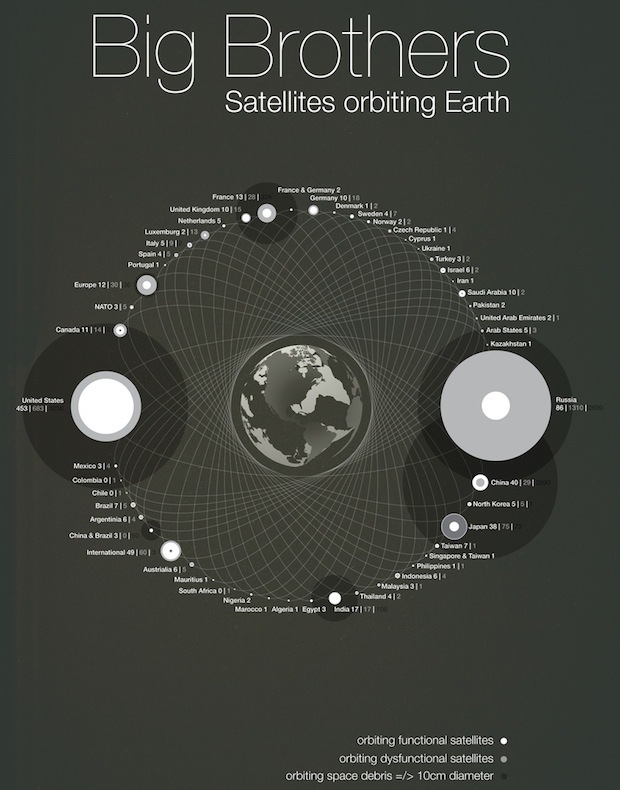 The U.S. obviously contributes a lot of space junk, but we also send far more satellites into orbit. So we have about 1,000 working and broken satellites in space; we produced about 3,300 pieces of space junk. But China? They’ve launched less than 70 into orbit while producing 2,000 bit of debris, which sounds like they’re just firing stuff into orbit and crossing their fingers. The recent history of Russia, in the meantime, is likewise visible. They’ve got 1,300 broken satellites up there, but only 86 are still functioning, which could be considered both a sign of the collapse of the U.S.S.R.’s space program and the heavily low-tech, oil-based reality of their modern economy.